It’s always a wonder to me that more home bakers don’t make their own crackers. As long as you stick to a few basics and keep an eagle eye on them while they’re baking, crackers are surprisingly easy to make. This recipe yields crunchy cheddar cheese crackers that are sure to be a hit at your next games night or holiday party. But be forewarned: they’re so tasty they might never make it out of your kitchen! 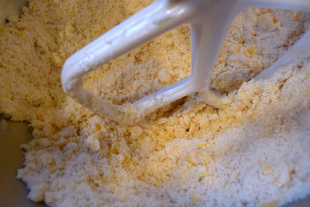 Make the dough: In the bowl of a stand mixer, combine flour, sugar, salt and baking soda. Using the flat beater on low speed, mix in the oil and shortening until there are no pieces larger than the size of a pea, about 1 minute. Add the shredded cheese and beat for about 2 minutes, until the cheese is broken down into small bits. Now add the water and beat for about 30 seconds, until all the dough sticks in a mass on the beater. Knead and let rest: On a clean unfloured surface, knead the dough vigorously for 5 minutes, by which time all of the cheese will be incorporated into the dough (a few flecks here and there are okay). The dough should be smooth and pliable. Put the dough on a counter, cover with the mixing bowl and let rest for 30 minutes before continuing. Set a rack in the middle of your oven and preheat to 425°. 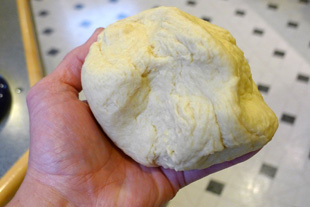 Roll out and pan the dough: Cut dough into three equal pieces. On a lightly floured surface, roll one piece into a rough rectangle 10” x 15”. To achieve this, you may have to roll the dough, let it rest and roll again. You want a sheet of dough that is about 1/16” thick. Some irregularity is inevitable; don’t worry about it. Use a small amount of flour as necessary to prevent sticking. Gently pick the finished rectangle of dough off of the counter and spread it onto an ungreased cookie sheet. Cut and prick: Using a pizza cutter or pasta roller, cut the sheet of dough into 1½” squares. The uneven edges of the dough can either be made into crazy shapes or cut off to be used in the dough the next time. Your choice. 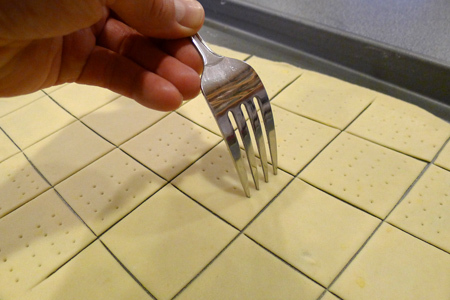 Make holes in the dough with a serving fork as shown in the photo. This will keep the centers from puffing up. Sprinkle cut crackers lightly with salt before baking. Bake, turn and cool: (Be sure to see Baking Notes below) Bake crackers at 425° for 5 minutes, turn over and bake for a further 3 minutes. 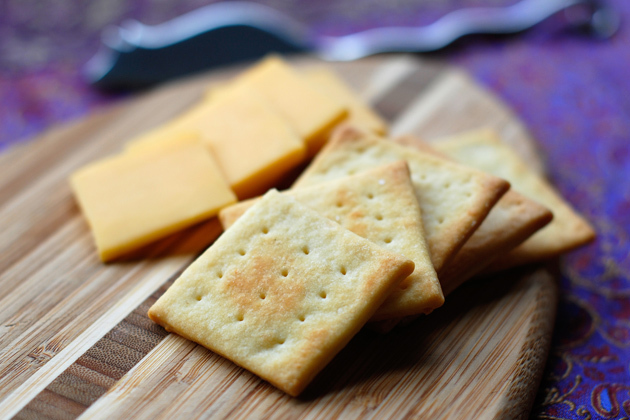 If some of your thinner crackers are cooked sooner, pull them out before they overcook. Otherwise, remove to a rack when the crackers are light brown and let cool for 10 minutes or more. Repeat last three steps with each piece of dough. Serve these tasty crackers with hummus, cream cheese or your favorite dip and then watch them disappear! Baking Notes: Crackers are so darned thin that baking them magnifies the differences between individual ovens. This is where it’s essential that you know your oven. For example, my gas oven cooks hotter around the outside, so when I turn them I rotate the outer crackers to the middle. Please use the times above as a guideline. Even a minute too long can overcook these crackers. If you err on the undercooked side, put cooled crackers in a single layer on a cooling rack and return to a 300° oven for 10 minutes. I eat a lot of crackers – thinking about all the money I could save by making these! They look really good! Great job! I went on a cracker-baking binge last winter after I saw a video by Mark Bittman and realized how easy they were. And then just sort of stopped as the weather warmed. Thanks for the reminder – yours look perfect! You’ve been reading my mind…I’ve been wanting to make homemade crackers and thought I might get around to it this holiday season…but havent. Your crackers look so professionally done. I can’t wait to give this a try. Thanks for sharing with great supporting images. I hope you and your loved ones have been enjoying a beautiful holiday season! Wow those cheese crackers look amazing, so perfect!! Not to mention they look insanely delicious. I’ve never made homemade crackers but really want to one day. It definitely looks worth it! Oh boy!! I have been looking for a recipe for home-made crackers for some time! I think this is it! (I have tried some cracker recipes but they just didn’t hit the spot). I can’t wait to try these. Thank you! Oh wow..these look fantastic! I’m bookmarking this to try. I love cheese crackers. Thanks very much for sharing. Happy Holidays! very smart idea! Cons!!! Would love to have some with my coffee!!! These are mighty impressive. I think you could end up as one of the Keebler elves this coming year! Each of my ovens bakes things differently, so you are wise to warn the future homemade cracker bakers. I am sure these can brown very quickly. I love eating homemade crackers, but have found that my patience isn’t quite good enough to cut them all out. Crackers are on my ” to bake” list. These look tremendous. I love that they use real cheese. Question, though. What is non-hydrogenated shortening? I thought by definition shortening was hydrogenated oil. No? Hope you all had a wonderful Christmas and are set for a fabulous New Year! Let me see if I have this straight. ‘Shortening’ describes the ability of a fat to mix with flour in a way that gives cookies, pie crusts and some crackers a crispy crumbly texture. Crisco and clarified pork fat do this very well, but contain trans fats which aren’t good for us. Spectrum Organic Vegetable Shortening, which is pressed palm kernel oil, has the same characteristic without the side effects. While it still has saturated fats, palm oil has no trans fats, and even has a large proportion of the fats that are good for us. Spectrum can be found in the organic food section of many grocery stores. I’ve been using Spectrum for a few years now as a healthy alternative to Crisco. Even though Crisco reformulated its product in 2007 to reduce trans fat to less than 1 gram per serving (not exactly the ‘no trans fats’ it says on its label), I’ve never gone back. Don, I agree, these are some perfect looking crackers, and the dough is perfectly done. Now THAT is impressive. Totally professional, really beautiful and something I really want to try! I’ve never made crackers before! Thank you for sharing. You’re right, I never would’ve thought to make my own crackers at home! Definitely going to have to try it out now! These look fabulous, just saw them on top 9 today and I had to come and take a look. I have thought of making my own crackers before, but I bet mine wouldnt look as perfect as yours! Well done! Amazing job on these….they look wonderful. I’ve made my own crackers before and while always fun and tasty they never look this good. These look perfect! Love the use of the golden cheddar to add color to the cracker … now, a challenge. Can you develop a GF cracker recipe that gives the same crunch and cheese factor? Wow, you are quite the cracker maker! These are so perfect-looking that it’s hard to believe they’re homemade! Congrats on the top 9, and Happy New Year! Hi Don-Just noticed that your homemade cheese cracker are on the Top 9, this morning. Quite tedious job, making these crackers to turn out so perfect, as yours. The secret must be in the rolling, to make them thin, and the timing of the baking. Amazing, and yummy crackers, as a result! I can’t believe how perfect your crackers look! Gorgeous! And I bet they taste even better. You’ve earned a well-deserved place in the Top 9 today. Congrats! I have always wanted to try making crackers. They look great! I always wanted to make my own crackers. And yours look terrific! Bookmarked this for later use. Thank you so much for sharing. Wishing you & your family a Happy New Year. These look fab!!! Thanks for sharing the recipe! Wow, those are darn perfect!! Wow!! Congrats on food buzz top 9!! I’m so impressed by this! I’ve contemplated making my own crackers before (I think crackers should be a food group) but haven’t gotten around to it. I’m definitely inspired to try this out. I don’t know if I have ever called a cracker beautiful before, but your crackers are! They look so perfect, and I bet they were delicious as well with the cheddar! So much better than store bought ! delicious! Love them! Happy new year! 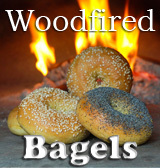 Here is hoping that everyone gets baking in wood fired ovens! These crackers look delicious, and absolutely perfect! This is something I never would have thought to make, but yeah, why not?! I have a friend in the nauseated throes of early pregnancy who would appreciate these. Can they be made without the cheese without making any other adjustments? After reading this pos,t I am now wondering why I have never made my own crackers! They look delicious! Definitely bookmarking this one! Thanks! Oh, man. These look phenomenal! They are perfect for the cracker portion of my 2011 Baking Challenge! Plus, I’ve been super into Cheez-It’s lately, so this will surely be better for me. You are so right! I always think I should make my own crackers… but then run out of time or focus on other recipes. Shame on me! I’ll make it a priority to make my own crackers very soon. Your recipe looks great! Thanks.I was looking for that recipe for long.Thanks to you I will made my homemade crakers. 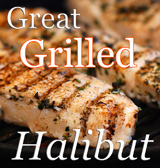 Just found your site from the fresh loaf homepage and I after reading several pages, my mouth is watering, thanks for sharing this and other recipes! Don – These sound and look so delicious and simple! Well, other than the whole pricking part…I’m not sure I have the patience for that. But if they’re as good as you say they are, I may have to give tis a try. Thanks. These look great! I’m going to try them today. Have you ever made any using whole wheat flour? Those are wonderful!!! The hit for parties!